Saracens Mavericks and Manchester Thunder kept the pressure on leaders Wasps with Superleague wins on Monday. Mavericks won 65-37 against London Pulse, while Thunder earned an 83-56 victory at Celtic Dragons. Both sides move within three points of defending champions Wasps, who maintained their 100% record by edging past Team Bath on Friday. 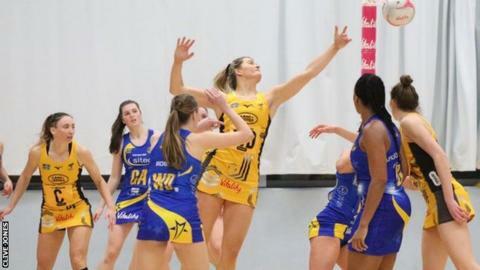 Loughborough Lightning continued their upturn in form by beating Surrey Storm 66-50, while Severn Stars also won. Stars recorded only their second victory of the season, winning 56-37 at Strathclyde Sirens on Friday. Wasps' chances of defending their title and completing a hat-trick of wins look strong after they withstood late pressure from Bath to win by 11 in Somerset. The remaining unbeaten team in the Superleague pushed on in the second quarter, building an unassailable lead to stretch their advantage at the top of the table to six points. Despite the loss, Bath's showing was much improved from their heavy loss to Mavericks in the last round, and they were also boosted by the return of England internationals Serena Guthrie and Eboni Usuro-Brown from injury. "After five and a half weeks of rehab, it was great to be back on court with Team Bath last night," Usuro Brown tweeted after her first appearance since the opening game of the season. "Not the result we wanted but a marked improvement from last week's game! "Thank you to our fans for your support, we heard you loud and clear." Life for an elite netballer is far from 'just turn up and play for 60 minutes once a week'. Just ask Severn Stars defender Sam Cook and Wasps shot-stopper Josie Huckle. There are five-hour coach journeys to away games, training sessions and club duties to pack in around full-time jobs and home life, and that could be in the space of three days. Cook made a mammoth trip from Gloucester to Glasgow on Friday as Stars took on Sirens in the Superleague. Her netball duties then took her to Guildford via Leeds and Gloucester, before she finally returned home to the Cotswolds at 18:00 GMT on Sunday. Wasps defender Huckle, who also juggles a full-time job as head of netball at Bedford Girls' School, has travelled a similar distance with three away games in a week. Between her job and netball commitments, Huckle clocks up around 20,000 miles per year - that's almost a whole trip around the world. Loughborough Lightning find themselves in the top four of the table for the first time this season after a comfortable win over Surrey Storm, who slip to sixth. Severn Stars piled more misery on Strathclyde Sirens, who are yet to win at home in 2019, with a sterling attacking performance to secure their first victory since round three.